Tucked between lava flows, the Kona residence is designed as a series of pods, each wit its own distinct features. 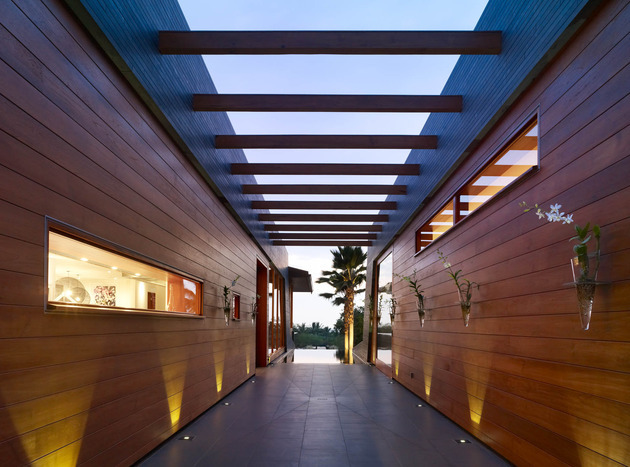 The 3 pods are joined on a central axis with an exterior corridor, and face either east towards the volcanic mountain views or west to the ocean. Two of the pods are guest suites complete with a common area, the third is the main living area with master suite and media room. 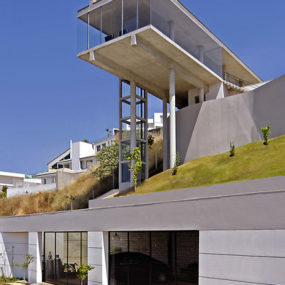 Photovoltaic panels cover the roof in two sections and rainwater is collected and stored in three dry wells. 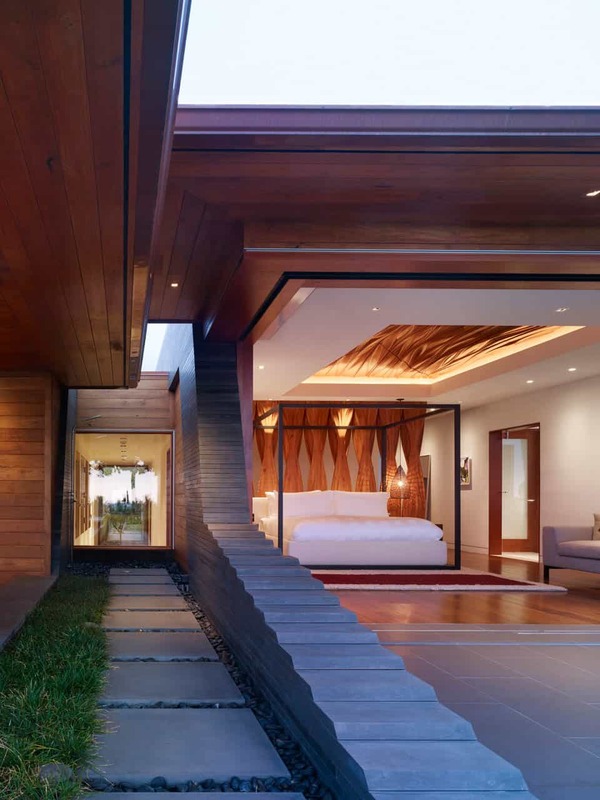 Reclaimed teak timbers from barns and train tracks are used in combination with stacked and cut lava rock for the façade. 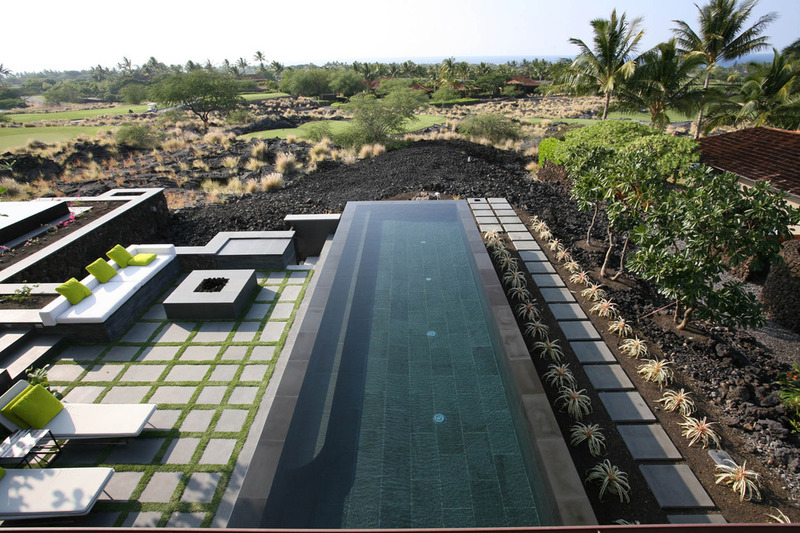 The dark lava rock is also used as stones to help heat the pool water via solar transfer. 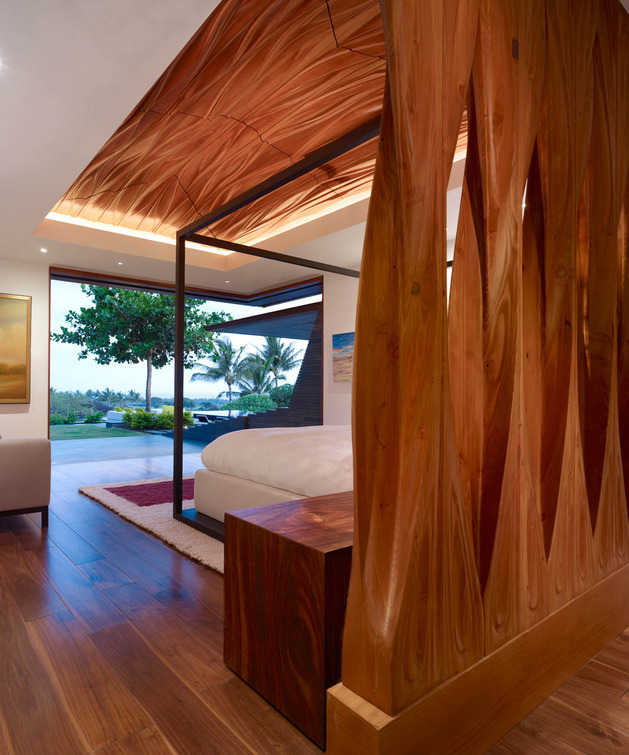 Both the teak timbers and the lava rock have historical reference in Hawaiian tradition The traditional Hawaiian references are continued through wood carving craftsmanship that can be seen on various digitally sculpted wood ceilings and screens throughout the home, and on this outdoor pavilion which was inspired by the local basket weaving craft and is a visual re-enactment of the traditional gift ceremony performed upon arrival. 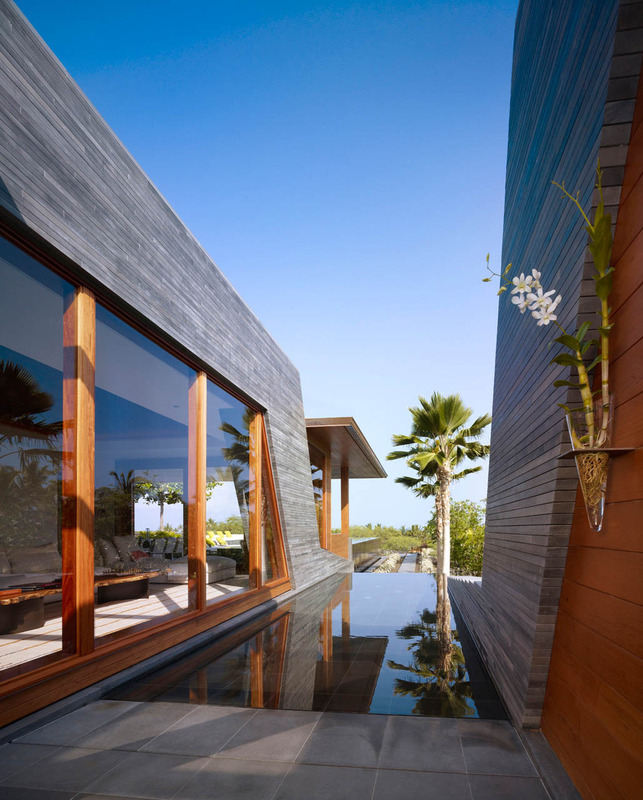 The façade of the Kona residence is a combination of stacked lava stone, and reclaimed teak timbers that have been planed to bring out the natural warm tones of the fresh wood. The use of both lava stone and planed timbers continue on the inside of the home. 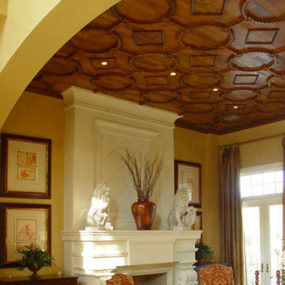 The timbered ceiling coffer is framed in a perimeter-ceiling of drywall with recessed pot lights and the grey timbered wall is given additional prominence by its angular design. 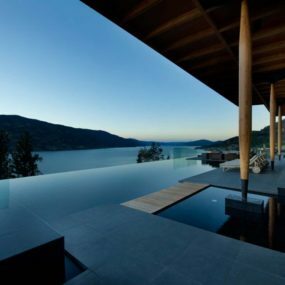 With infinity edges, the pool seems to go on forever, only the distant tree foliage breaks the line of water to horizon. The pool is lined with lava stone. 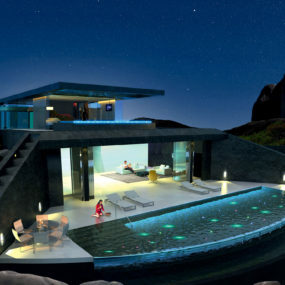 The dark shade of the stones absorbs the heat of the sun and keeps the waters from getting too cold. 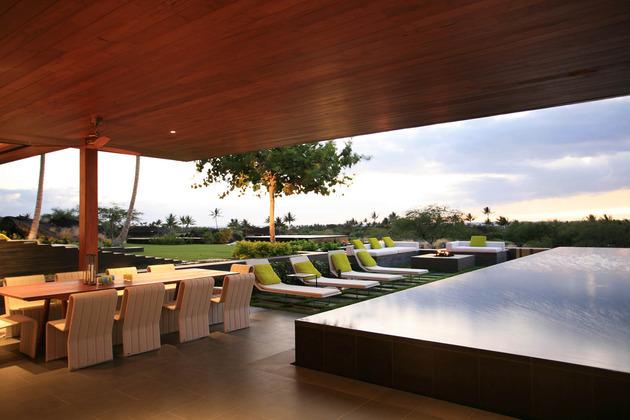 Concrete pavers, grouted with grass surround the pool and a simple modern fire pit doubles as a coffee table to a lounging bench that offers pops of green as a reference to the grass grouting. As the day slowly shifts to evening the surface of the pool reflects light from the sky above. 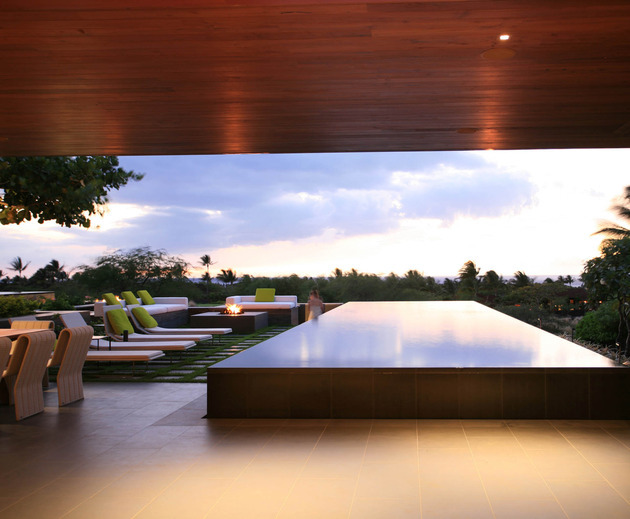 Although the pool faces out to the stunning views, just to the left of the lounge area is a large expanse of grass, creating the perfect place for outdoor games. 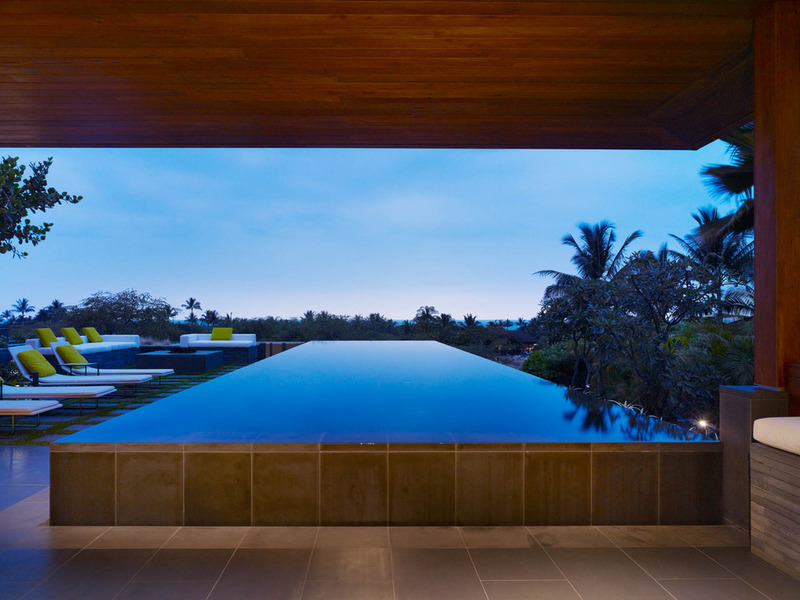 The pool points in one direction to the views, in the other to the main living space. 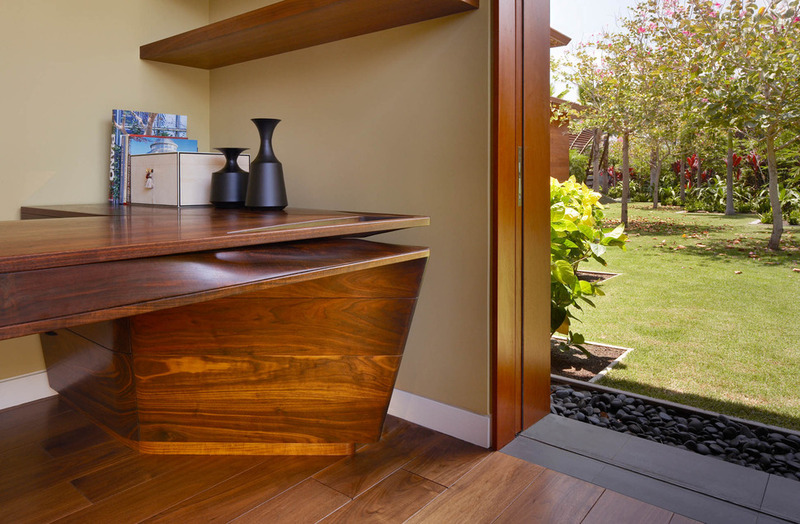 Here the wall completely opens up for an unobstructed connection to the outdoor lifestyle that Hawaiian climate offers. The privacy screen is a thick section of lava stones that form a vertical wall that falls in a staggered pattern down to a horizontal wall just above the line of the pool itself. 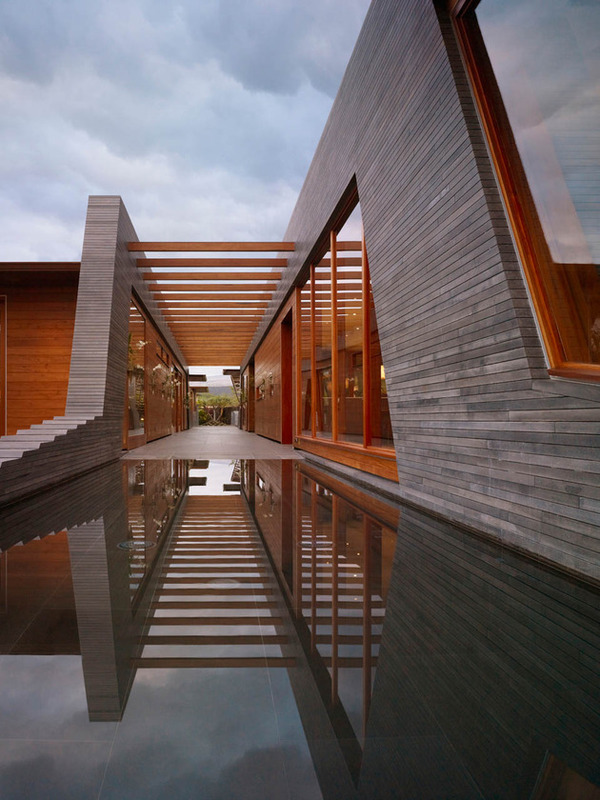 The pool is the punctuation at the end of the a corridor that joins the main living zone with two bedroom pods. The corridor that joins the three sections of the home offers a visual connection to each space with the use of exposed beams that travel from one side to the other. 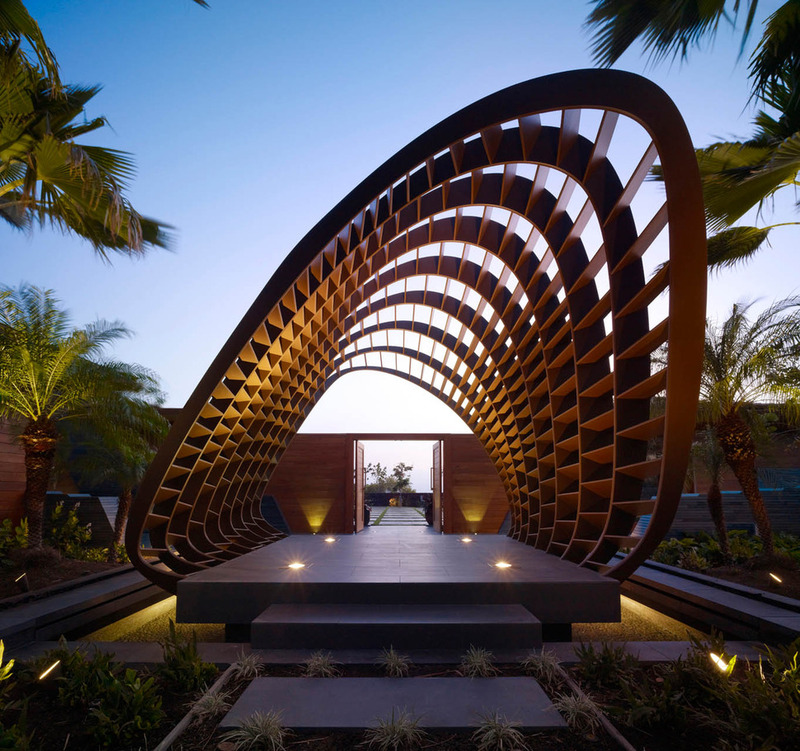 The repeating beams create a visual connection to the basketry pattern on the entry pavilion. From a distance the continuing plane of the side pool into the concrete corridor, mirrored by the gridded pattern of the exposed beams juxtaposed against the angles used in the privacy wall and living space. 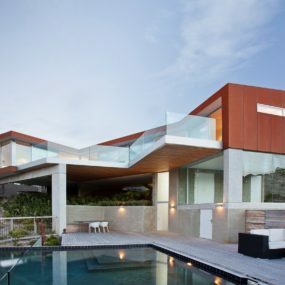 and intertwined with the lava stone and natural teak tones all create a perspective of modern intrigue. The main living space runs a long length of the corridor wall. A large sectional faces not out to the infinity pool, but rather to the side pool, behind it is the equally large dining area. Here a table of 12 rests quietly under 3 statement globes of light. The living space incorporates a unique custom window detail where the windows meet in the corner without the use of a corner mullein or post. 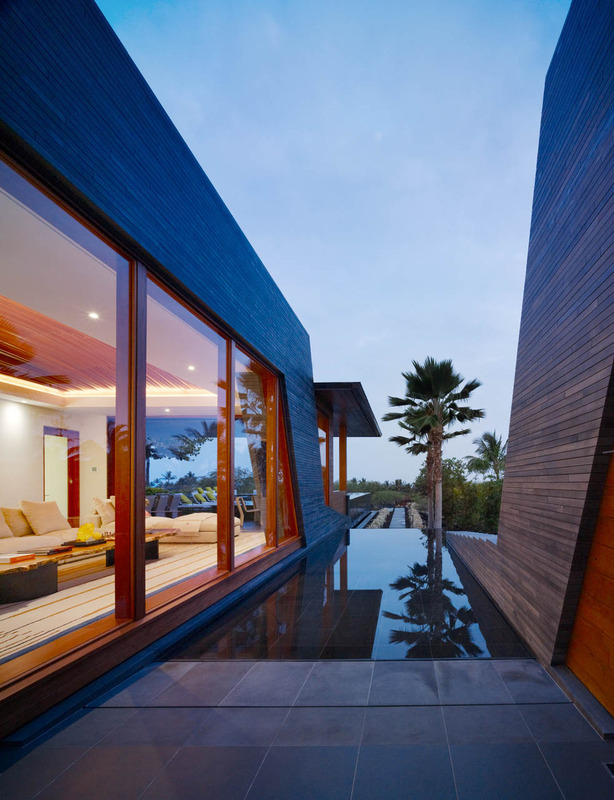 When the windows on both sides are fully stacked into the wall and out of sight, the opening is complete and unobstructed. 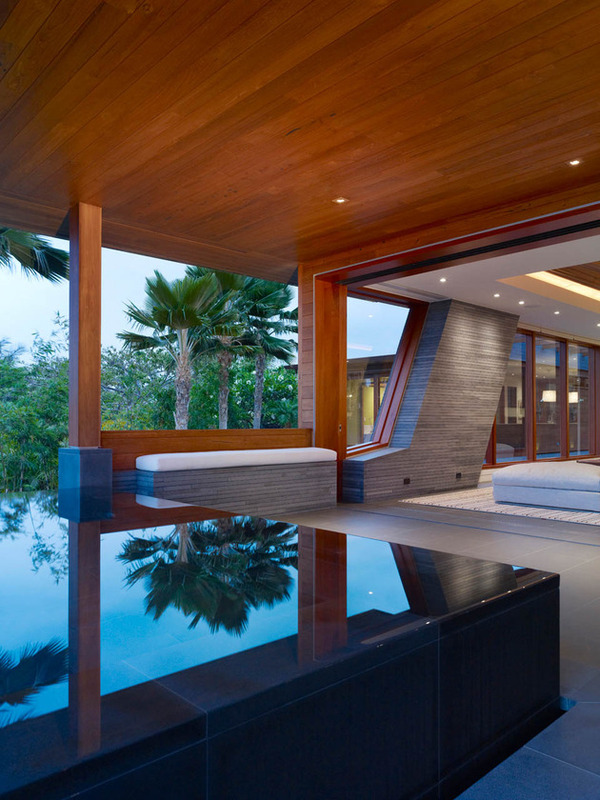 Just past the custom windows is a series of closed planes of glass that look over the side pool. 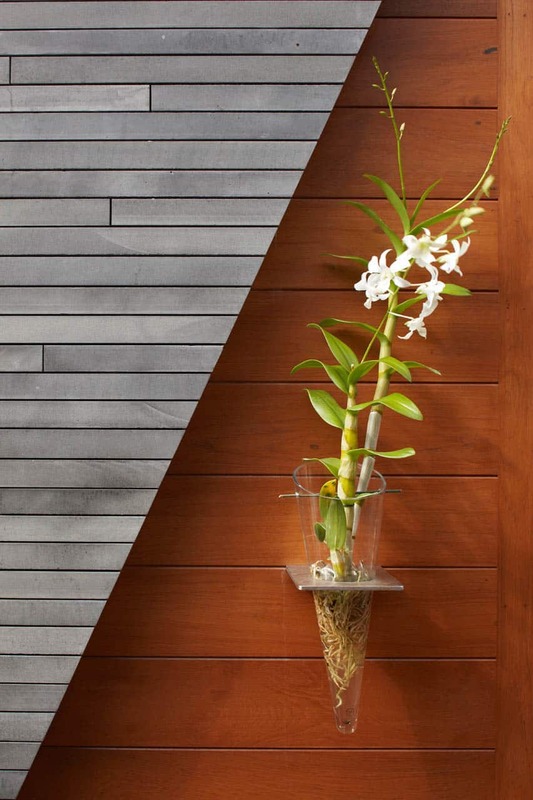 A small wall mounted vase adds a touch of elegance to the otherwise graphic space. Even the vase incorporates angles in its design. The corridor continues down to the two bedroom pods. One to the side and one at the far end. The main living zone also continues down the path with the kitchen and Master Suite at the far end. 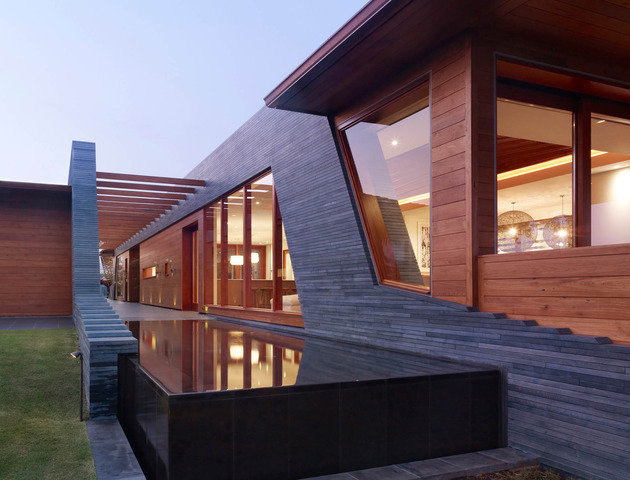 As the path travels down to the more private sections of the home it adjusts its material from a solid concrete pad to concrete pavers surrounded with grass. The kitchen is a clean and sleek galley design with an island of cabinetry that extends its counter into a seating area for 7. 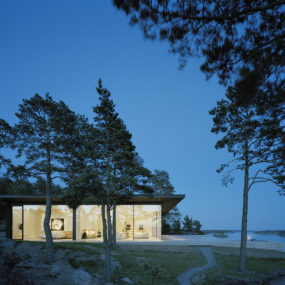 The eating area is defined by a change of material. 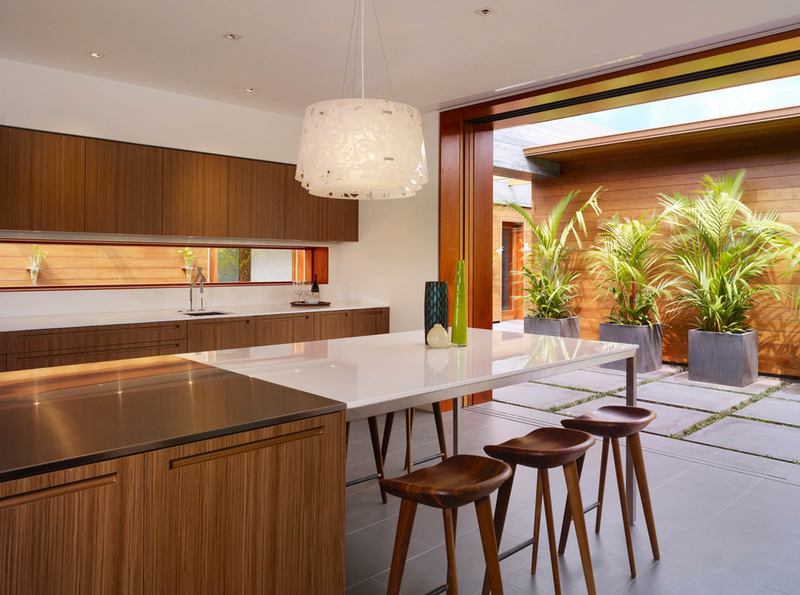 The white of the eating surface is mirrored in the white of the light pendant. 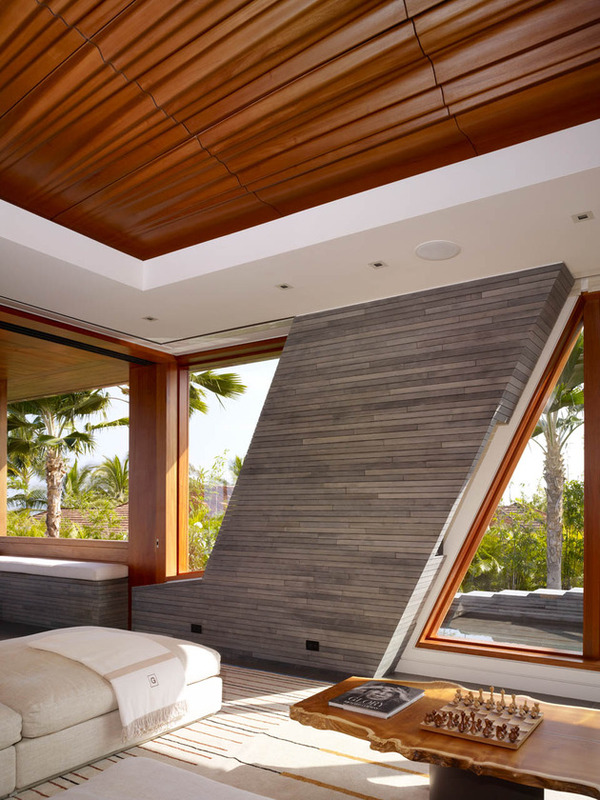 Here, too, windows open and stack out of sight, into the wall for an outdoor lifestyle. The Master Bedroom incorporates many of the same design features used in the rest of the main living space. 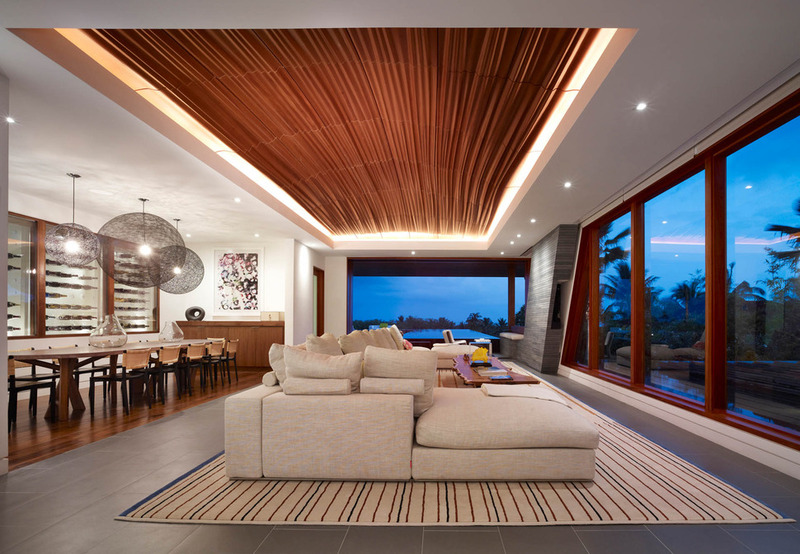 Here too, custom windows wrap the corner, privacy screens are created with the use of hand sculpted teak posts and the coffer in the ceiling is covered in teak, surrounded by a drywall drop with pot lights. The Master Bath is a study of minimalism. Here two large vessel sinks perch on top a long vanity with an open shelf for towels. Through the opening created by the stackable windows is an outdoor soaker tub. There is also an outdoor shower located at the end of the central corridor. 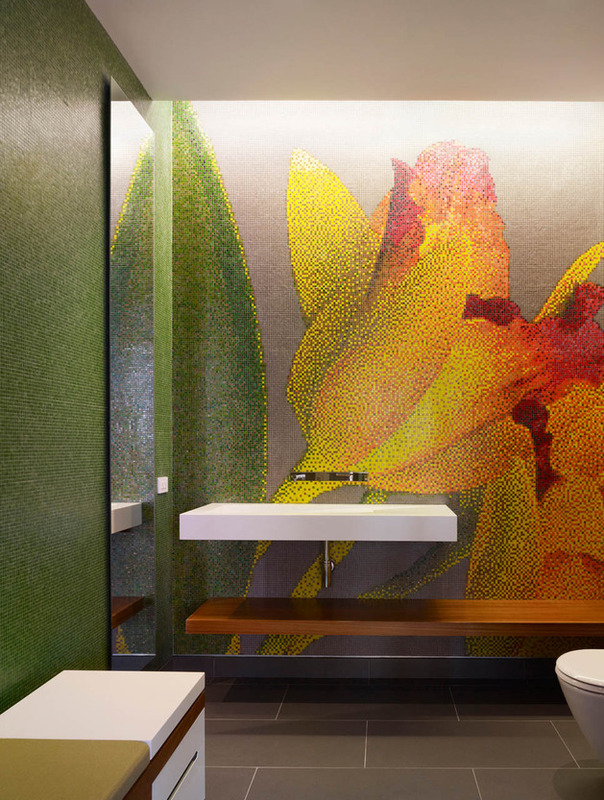 Another bathroom features a beautiful mosaic on the wall of tropical flowers. The pointillism effect of the small tiles creates a surreal contrast to the sharp white rectangle of the wall-mounted sink. The lower level wood shelf almost disappears into the wall graphic. 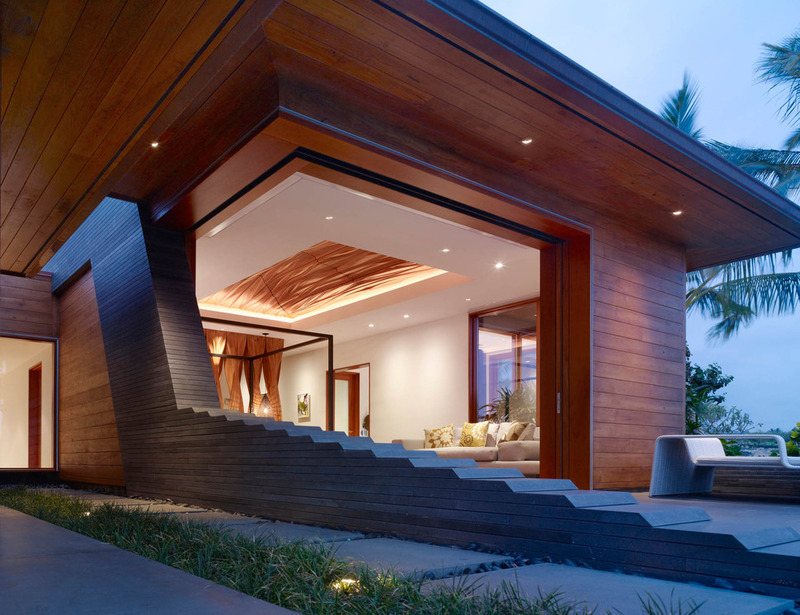 Throughout this Hawaiian home, the details create vistas of sculptural forms that are a mixture of traditional and modern techniques. 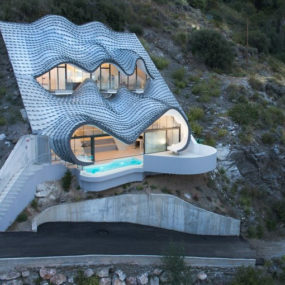 The final result is one of calculated artistic composition that combines craft with material and form. Each space is a collection of visceral experiences that is sure to engage all who arrive.